Status: Inactive; Active 1968-1971. Born: 1938-02-03. Birth Place: Simferopol. Received candidate of technical sciences degree from Paton-Institute (IEP), Kiev, 1966. Civilian Engineer, Paton Institute. Suspended after a car accident, 1971. Retired from training group 1973. 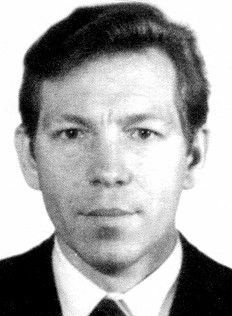 From 1992 to 1996 Director of Paton-Institute (NPO VISP). Retired in 1998. Family: Cosmonaut. People: Paton. Country: Ukraine. Flights: Soyuz n 19, Soyuz Kontakt P. Bibliography: 4452. 1938 February 3 - . Birth of Vladimir Grigoryevich Fartushny - . Nation: Ukraine. Related Persons: Fartushny. Ukrainian engineer cosmonaut, 1968-1971..
1968 March 27 - . Vulkan Engineering Cosmonaut Training Group selected. - . Nation: Russia. Related Persons: Fartushny. The group was selected to provide engineer to operate Vulkan space welding system..
Soyuz n 20 (cancelled) - . Crew: Fartushny, Shatalov. Nation: Russia. Related Persons: Fartushny, Shatalov. Program: Lunar L3. Flight: Soyuz n 20. Spacecraft Bus: Soyuz. Spacecraft: Soyuz Kontakt. The active spacecraft in the second planned test of the Kontakt lunar rendezvous/docking system..
Soyuz Kontakt P (cancelled) - . Crew: Lazarev, Makarov. Backup Crew: Fartushny, Klimuk. Nation: Russia. Program: Lunar L3. Flight: Soyuz Kontakt P. Spacecraft Bus: Soyuz. Spacecraft: Soyuz Kontakt. Final crews selected for a dual Soyuz mission in Earth orbit to test the Kontakt docking system to be used on the lunar landing LOK and LK spacecraft. The Kontakt-P Soyuz would have been the passive spacecraft, simulating the LK lunar lander..